Home » It’s World Spay Day…let’s learn about laparoscopic spays! It’s World Spay Day! Did you know that we were the 2nd clinic in Toronto to offer laparoscopic spays for dogs and cats, and we see patients from across the city and beyond…and even from other provinces? “Lap spays” can reduce post-surgery pain by up to 65% compared to a traditional spay, and the recovery time can be as little as 2 days – an important consideration for energetic puppies and kittens that will find it hard to stay still for 2 weeks for a traditional spay surgery recovery! So what IS a laparoscopic spay? It is done using a camera and precise instruments that are inserted through two tiny incisions in your pet’s abdomen, and used to remove only the ovaries. A traditional spay surgery on the other hand requires a long incision to be made to open your pet’s abdomen, and both the uterus and ovaries are removed. Additionally, the special instruments used for laparoscopic spays cauterize tissue, blood vessels and nerve endings before cutting them, resulting in substantially less bleeding and pain than a traditional spay surgery, during which some tearing of tissue is unavoidable. This is a picture from one of our recent lap spay surgeries. Registered Vet Tech Christie (on the left) is operating the instrument with the camera and light; RVT Vanessa (on the right) is monitoring the dog’s heart, breathing, blood pressure and depth of anaesthesia; and Dr. Mark is using a special tool to cauterize and then cut the tissue connecting the ovary to the body, which you can see on the computer screen in the top right of the picture. The ovary is the white tissue above the tip of the instrument. 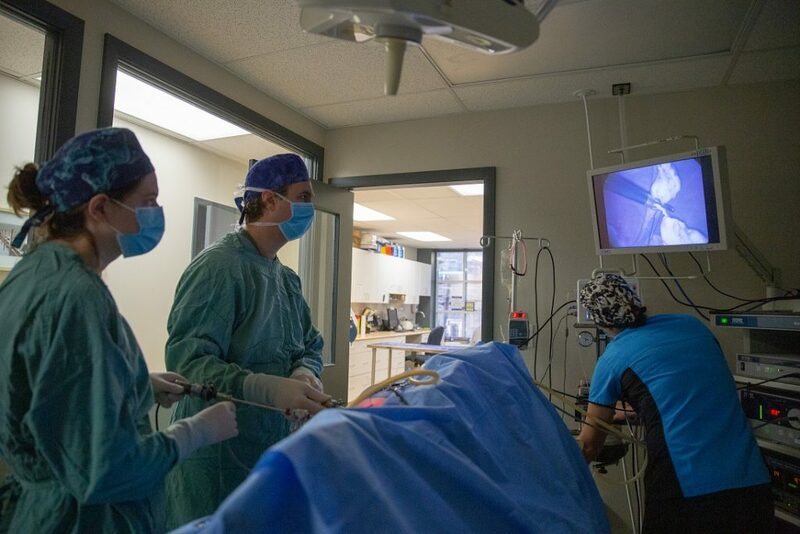 This shows how precise and minimally invasive lap spay surgeries are, which is why the healing time is so much faster than for traditional spays. Curious to see more? You can see videos of every step in the lap spay process here. Wondering if a laparoscopic spay is right for your puppy or kitten? Give us a call at 416-538-8387 and we will be happy to answer your questions, or book a consultation with Dr. Mark or Dr. Karen today!